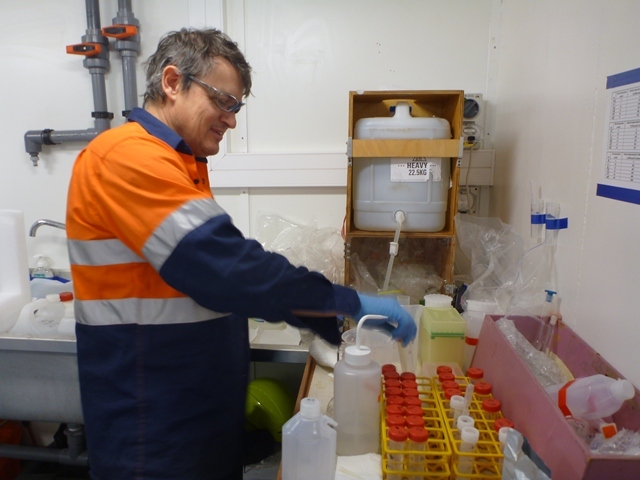 One of the primary aims of this voyage has been to monitor the formation of High Salinity Shelf Water at the Wilkes/Adelie Land shelf and its end product, the Antarctic bottom water. 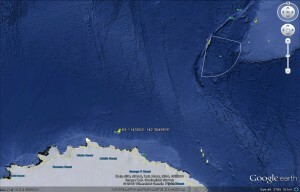 The Antarctic bottom water can be found at the very bottom of the ocean, directly overlaying the sea floor. This cold, salty, and therefore dense water spreads across the very deep, abyssal (greater than 3000 m) plains of the global ocean and can be found as far north as the equator. This water, which has recently been in contact with the atmosphere, helps ventilate the deep ocean by delivering oxygen to the abyss. It also plays an important role in the carbon cycle with the uptake of carbon via the biological pump (more on this in future blog posts). Bottom waters are formed in the high latitudes of both hemispheres. In the Northern Hemisphere the densest waters are formed in the North Atlantic Ocean, in the Labrador and Greenland seas. They export the cold water from the arctic ocean into the deep ocean, which travels south via bottom currents through the Atlantic Ocean, eventually mixing with other deep waters in the Southern Ocean. In the Southern Hemisphere, several different formation spots exist for Antarctic bottom water. The major sources are the Weddell and Ross Sea, but there are several other source areas around Antarctica. A combination of several factors is required to make a suitable source region: the shape of the coastline, a deep basin acting as a pool or a long thin plateau, and a polynya system (see previous blog post ‘What is a polynya?’). The Mertz Glacier polynya is a very important location for the production of the dense salty waters. Strong katabatic winds along an L-shaped polynya, over the Adelie Depression, act as a factory for High Salinity Shelf Water during sea ice formation. The High Salinity Shelf Waters pool in the underlying basin, before overflowing and cascading down the Antarctic continental slope, feeding the Antarctic bottom water. It is the third biggest source of Antarctic bottom water after the Weddell and Ross Seas. Any change to one of the physical parameters may change the rate of Antarctic bottom water production. The Mertz Glacier Tongue calving that occurred in February 2010 has completely changed the coastline and the ice conditions in this region. The size, shape and location of the polynya has been altered, with a resulting reduction in the High Salinity Shelf Waters that form the Antarctic bottom waters. This will have downstream effects on deep water circulation, the carbon cycle and the climate system. 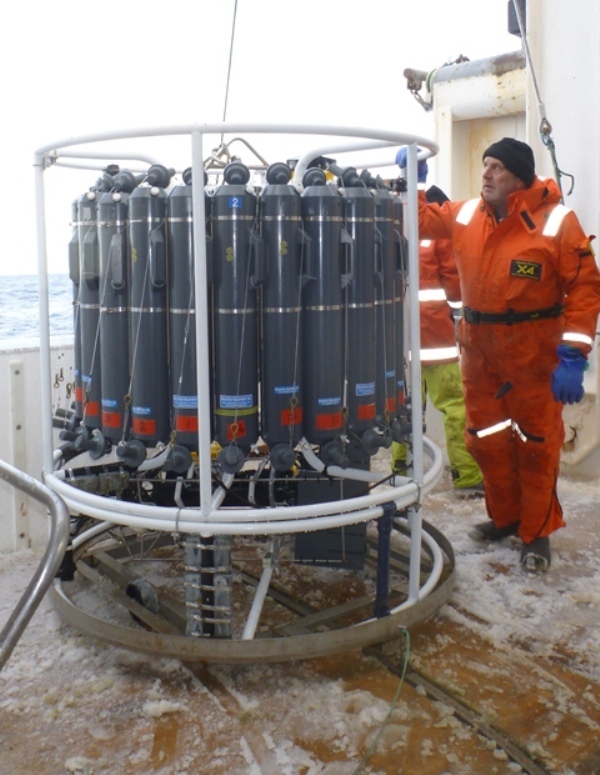 As the sea ice is currently preventing us from getting on to the Antarctic continental shelf to directly measure the water in the polynya (and retrieve the moorings – see previous blog post ‘What is a polynya?’), we are now focussing our efforts on the continental slope. We are undertaking a hydrology (water mass) survey using the CTD to look for the outflow of the high salinity, cold, dense waters flowing off the shelf down a series of canyons. 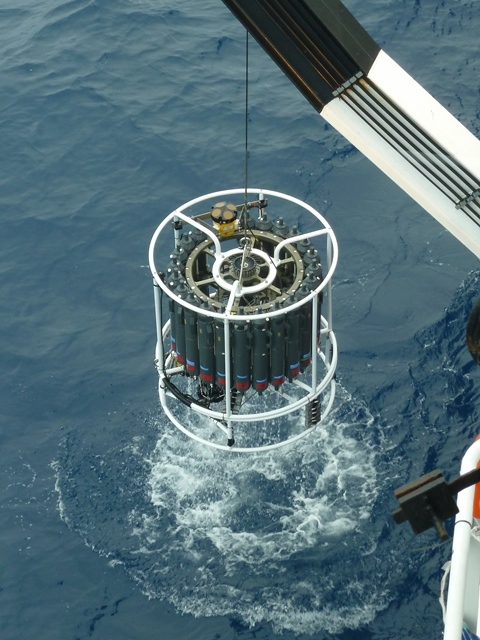 We are finding evidence in the CTD profiles for these salty, cold, oxygen-rich waters just above the sea bed. The challenge now is to discriminate between locally formed dense waters from Antarctic bottom water formed in the Ross Sea and then transported west in to this region by the Antarctic Current. We are still hoping that the sea ice might open up and let us make a dash for the moorings! Keep your fingers crossed for us.